Gunnar Staalesen is one of the most distinctive voices in contemporary Scandinavian crime fiction, and one of the most venerable, in terms of the length of his career. His voice as a writer is also, in a way, the most distinctively Scandinavian. His hero, Varg Veum, is a private detective but also a former social worker. And his cases inevitably reflect his background. Cold Hearts, the latest Veum novel to be translated (by Don Bartlett, for Arcadia Books), deals with prostitution, drugs, and murder, but the essential subject is the one Veum most frequently confronts: the impact of adult crimes on the children directly or indirectly involved. 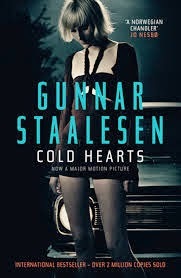 In Cold Hearts (the use of the word "cold" seems too tempting for publishers to resist for far-norhtern crime fiction, but the title is in this case a direct translation of the original Norwegian, and very apt for the topic) a former girlfriend of Veum's son approaches him to try to find a missing colleague (like the former girlfriend, a prostitute). What Veum finds is a disheartening story of the girl's upbringing in a family of alcoholics as well as the care of a committee of community "well-wishers," once the parents' inadequacy is at least in part out int he open. There's a parallel plot concerning a missing shipment of drugs, which comes occasionally into a relation to the main plot, as we expect in crime novels, but is resolved in an unexpected way. The two covers I've reproduced here are for the current Arcadia edition and for an earlier one that, as far as I can tell, was never released. Like the use of the word "cold," cover images of prostitution seem irresistible to publishers, though I must admit in this case it's a clearer reference to the content of the book than anything to do with the miserable home life of the main characters. Veum's voice as a narrator is always sympathetic, and Staalesen's plotting is natural, never forced. It's only at the end that we see how the complicated twists and turns are really only misunderstandings, and the real story is as straightforward as it is unfortunate. In both voice and plot, Veum's (and Staalesen's) sympathy for the characters (and their empathy with their misfortunes) is always evident. While not breezy or comic, the stories are eminently readable. As with some other books I've read recently, this one has been made into the most recent of the Varg Veum TV films--and as in the other case, the story is considreably changed for TV, partly to accommodate a running character not drawn from the books (Varg's girlfriend). The TV series is very good, and the actors very well chosen, but the distinctive tone and the particular point of view of the stories is clearer in the books.